A Eulogy Service called Celebrating RJ Rosales is organized by the friends and family of the Filipino-Australian actor-singer in Singapore on December 12, 2011 at 6:00 pm to 10:00 pm. This will be held at Kallang Theatre, Reception Room at 1 Stadium Walk. There will be an open mic for everyone who would like to: a.) Share stories or memories of RJ; b.) Read or share a poem; c.) Sing a song or two; or d.) If you are too shy to sing, dedicate a song of your choice. In lieu of flowers, cash donations for the family will be collected. You can also bring along your favourite photo memory of RJ, if you have any. Nearest MRT is STADIUM Station along the Circle Line. For those driving, there are plenty of parking spots in the theatre carpark but do look out for a resident black & white cat who tends to make security rounds. This message comes from Cynthia Lee MacQuarrie, one of RJ's close theater friends in Singapore. 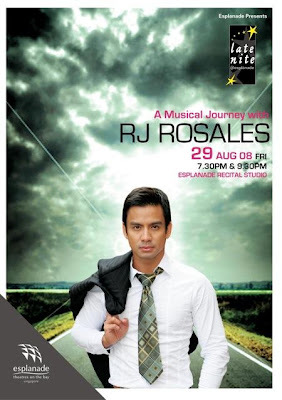 You can read my tribute for RJ Rosales (March 24, 1974 – December 5, 2011) here.